This week at the collaborative science blog Nothing in Biology Makes Sense, guest contributor Kathryn Turner discusses how evolutionary processes determine whether an introduced species becomes an invasive species. First, most obviously, how is it that a species is able to come into a new environment that it is not adapted to, surrounded by new environmental conditions and foreign biological interactions, and thrive? Thrive so exaggeratedly, that it can out-compete and displace species which have been there for millennia, adapting precisely to those environmental conditions and biological interactions? How can an individual survive to propagate a population? How can any species accomplish this? Second, less obviously: why can’t more species do it? Humans transport animals and seeds (and spores and larvae, etc, etc) around all the time, but only 10% establish self-sustaining populations, and only 1% spread to new habitats, becoming potentially invasive; this is known as the ‘tens rule’ (Williamson 1993) – a funny ‘rule of thumb’ for which I could never quite figure out the math. 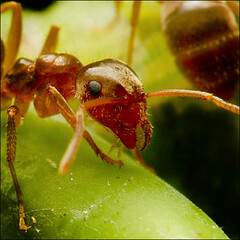 Cool ant! Anyone know what species it is? Anyone? Bueller? Photo by ViaMoi. This week’s video was going to be the one about shark-eating whales, until someone decided to illustrate Tom Lehrer’s “Elements” using Google’s shiny new instant-response search. I have my priorities. 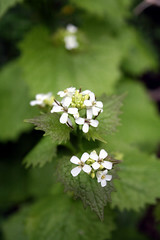 For invasive plants, flowering time is a trait that may often be under selection during colonization—when a plant flowers determines its climatic tolerances, its vulnerability to herbivores, and its compatibility with the local pollinator community. 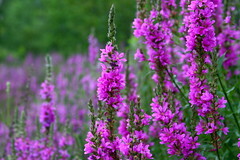 In a study just released online at Proceedings of the Royal Society B, Colautti and coauthors examined the evolution of this trait in a plant that has swept across eastern North America since its introduction from Europe: purple loosestrife, and found that it may be reaching the evolutionary limits of its invasive-ness. Purple loosestrife, Lythrum salicaria, may be running out of evolutionary steam as it invades more northerly climes. Photo by Steve_C. Loosestrife, like many organisms, faces a trade-off in establishing a time to reproduce, between early flowering and accumulating resources for seed production. Early flowering means producing fewer seeds, or provisioning them less thoroughly—but as loosestrife colonizes more and more northerly climes, it will be under selection to flower earlier in compensation for shorter and shorter growing seasons. But natural selection can only do so much. In order for natural selection to operate on a population, individuals in the population must vary in some trait that affects how many offspring they produce—if all individuals have the same trait value, or the same number of offspring, they’ll all have equal chances to contribute to the next generation, which will probably look pretty much like the parental generation. Furthermore, species colonizing new territory may actually lose variation, either because new popualtions may be founded by just a few individuals, or because of the action of natural selection itself. 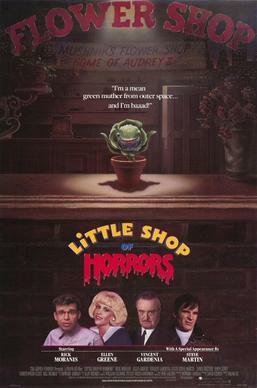 Finally, there may be a point at which plants simply cannot flower any earlier, because they must reach a certain developmental point before reproducing. Add these up for an invasive species moving north, and you might expect that the most recently-arrived (and most northerly) populations would flower earlier, and have less variation in flowering time, than more southerly populations. Using theoretical and experimental approaches, Colautti et al. show that exactly this process is occurring in purple loosestrife. They first built a mathematical model of natural selection acting on flowering time, which behaved as I’ve outlined above. They followed this by raising loosestrife seeds from northern and southern populations together in experimental sites located at different latitudes, and found that, even raised in southern conditions, seeds from northern sites grew into smaller, less productive plants. Raised in greenhouse conditions, seeds from southern populations produced plants with a much wider range of flowering times than seeds from northern populations. Together, these suggest that loosestrife has evolved earlier flowering times at northern sites—and may be running out of variation, the raw material for natural selection, as it moves north. Invasive species often evolve in response to their new habitats, and force native species to evolve in response to their arrival. As they colonize Australia, for instance, cane toads (soon to be a major motion picture) have evolved longer legs [PDF] so as to win the race for unoccupied breeding ponds; and exerted selection on native black snakes to tolerate the toads’ defensive toxins and to attack the toads less frequently. Better models of how newly introduced species respond to and exert natural selection may help conservation biologists anticipate the results of biological invasions. Invasive species not so bad? Certainly, they say, non-native plants and critters can be terribly destructive—the tree-killing gypsy moth comes to mind. Yet natives such as the Southern Pine Beetle can cause similar harm. The effects of exotics on biodiversity are mixed. Their entry into a region may reduce indigenous populations, but they’re not likely to cause any extinctions (at least on continents and in oceans—lakes and islands are more vulnerable). Since the arrival of Europeans in the New World, hundreds of imports have flourished in their new environments. 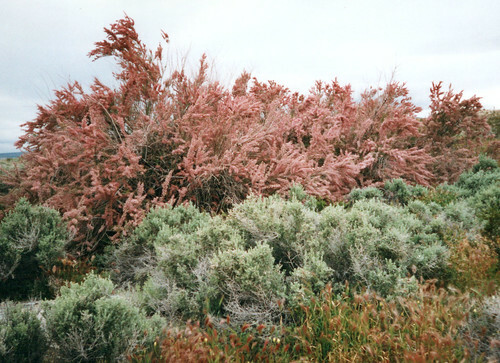 Tuhus-Dubrow cites the case of Tamarisk in the U.S. Southwest — an aggressive introduced shrub that has also ended up providing important nesting sites for the endangered southwestern willow flycatcher. The fact of the matter is that human-introduced species can eventually integrate into an ecological community; once they do it’s hard to get them out, and problematic as to whether it’s a good idea. In Australia, dingoes helped extirpate many other large predators when they were introduced by the first humans to arrive on that continent — and now they’re critical to controlling other, later-introduced mammal species. Invasive pest, or critical flycatcher habitat? Maybe both. Photo by Anita363. Introduced species can wreak havoc on the ecosystems they invade. But what happens after they’ve been established for centuries? A new study in the latest Proceedings of the Royal Society suggests that, in one case, an introduced species has actually become an important part of the native ecosystem — and helps protect native species from another invader [$-a]. The introduced species in question is the Australian dingo, the wild descendant of domestic dogs [$-a] that moved Down Under with the first humans to settle the continent. 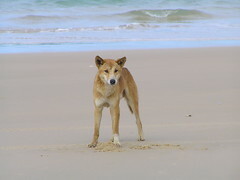 Today, 5,000 years after their introduction, dingoes are the largest predator in much of Australia, and they were a prominent part of the ecosystem encountered by European settlers. 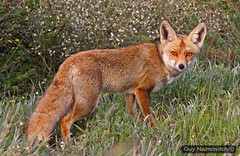 Europeans, like previous waves of human arrivals, brought their own domestic and semi-domestic animals — including red foxes, which prey on small native mammals. The new study’s authors hypothesized that because dingoes reduce red fox activity both through direct predation and through competition for larger prey species, dingoes should reduce fox predation on the smallest native mammals. At the same time, dingoes prey on kangaroos, the largest herbivore in the Australian bush — and reducing kangaroo populations should increase grass cover, providing more habitat for small native mammals. When the authors compared study sites with dingoes present to sites where dingoes had been excluded to protect livestock, this is what they found: increased grass cover, and greater diversity of small native mammals where dingoes were present. Recently a news article in Nature discussed ragamuffin earth [$-a] — the idea that human interference in nature has so dramatically changed natural systems that it may often be impossible to restore “pristine” ecological communities. In these cases, some ecologists say, conservation efforts might be better focused on how to maintain and improve the diversity and productivity of the novel ecosystems we’ve inadvertently created. It looks as though the dingo could be a poster child for exactly this approach. Getting away from it all: Why are invasive species invasive? When humans move from place to place, we almost always bring other organisms with us. Sometimes it’s intentional — domestic animals carried along with Polynesian colonists, for instance. 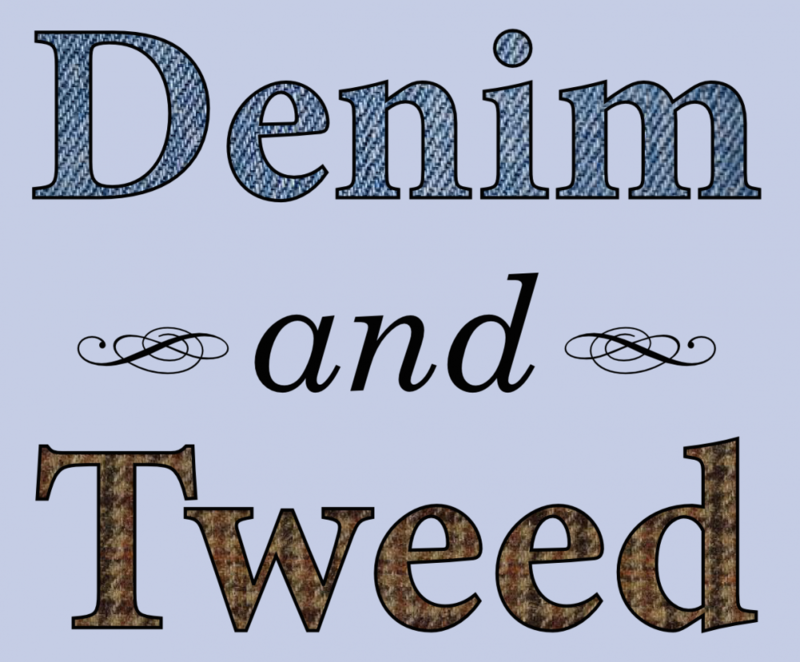 Just as often, it’s accidental, as with mice stowing away on Viking longships. A lot of these introduced species have done so well in their new habitats that they become invasive, outcompeting natives and disrupting local ecosystem processes. But the species that go crazy-invasive — the cane toads and the purple loosestrife — are probably only the very successful subset of the species that hitch rides in cargo holds and ballast tanks. What sets the dangerously successful invasive species apart from others? Coast wetlands. Photo by Muffet. A new dataset published in last week’s PNAS suggests that it may be an interaction between available resources in a new habitat and a lack of compatible pathogens [$-a]. This is an amalgam of two hypothesized causes for successful invasion: access to new resources, and escape from antagonistic species. Focusing on European plant species that have successfully invaded North America, the authors, Blumenthal et al., assembled records of viral and fungal infections on each plant species in its native range, and in North America. They classified the plant species based on the habitats each occupies — wet vs. dry, nitrogen-rich vs. -poor — and on whether the plants tended to grow slowly or rapidly. This is because plant species adapted to rich, wet environments are generally thought to evolve fewer defenses against infection and herbivores; they can “afford” to grow new tissue instead of fight to keep it. from Europe. Photo by clspeace. If resource availability interacts with freedom from infectious agents to spur a successful invasion, then invasive plants adapted to rich conditions should tend to host more pathogens in their home ranges than they do in their introduced range; and this difference should be less pronounced in invasive plants adapted to dry, resource-poor conditions. This is exactly what the analysis found — plants adapted to richer habitats saw a larger reduction in the number of pathogen species attacking them in their new ranges than plants adapted to less-productive conditions. This is a valuable result for its basic application — helping to predict which introduced species are likely to become invasive, and target them for eradication efforts before they become well-established. But it also provides us with an insight into how evolution works. Many authors, particularly G.G. Simpson and Dolph Schluter, have described ecological conditions that set the stage for adaptive radiation — the rapid diversification of a lineage into many species — which sound a lot like the “ecological release” that invasive species seem to experience. Rapid evolutionary diversification may be triggered by the evolution of a key innovation; by colonization of a new, empty habitat; or the removal of antagonistic species (usually by their extinction). These three classes of conditions are closely related, and they can be mimicked, or even replicated, when humans move species to new habitats [$-a]. Blumenthal et al. suggest, for instance, that species invasions entail both colonization of a new habitat and escape from pathogens. This is a broad observation; a good next step would be to directly compare natural selection acting on invasive plants in their native and introduced ranges. Through day-to-day processes like this, the specific ecology of a species can ultimately shape its evolutionary fate.